The iPad is definitely cool. If Nisus were to come out for it and run well in the 16GB version, I’d be tempted. But the iPad really throws the major flaw of the iPod Touch into the limelight: no ability to write quick scripts. You might think, hey, I’m not a programmer, why should I care? But the things you do use are written by programmers. And many times, at least in education, important things are written on-the-spot. You’re in the field (medical, military, business, educational) and you need something you’d normally write yourself or have your right-hand-tech-assistant whip up. With the app store model, you wait months even for things that should be a quick script. But the iPad does seem to make the Kindle worthless. At $500 for a multi-purpose computer vs. $260 for a dedicated book reader with a little web on the side, there doesn’t appear to be much of a competition. You’re going to have an iPad anyway for other things; what’s the point of buying a Kindle? But the Kindle isn’t the only thing the iPad competes with. This is a laptop. It’s not something for just sticking in your sidebag like an iPod Touch. This is a competitor to the MacBook line. If I buy this, I don’t buy a Macbook. Oddly, it contains a compass but not GPS. The 3GS version contains “assisted GPS” but, as far as I can tell from the specs, it doesn’t contain a real GPS. It will only work when in range of a cell tower or, possibly, a known wi-fi hotspot. Will it work on a 3GS-equipped iPad without a data plan? Is standalone GPS really that expensive? If the ePub format they’re using is standard ePub, that’s great. It’s like mp3 for books but even more open. And… like the iPod/iPhone, this is another device that doesn’t run Windows. And that uses the Macintosh development environment. Any Windows software author who makes a version of their app for the iPad has done most of the work of making a version of their app for Mac OS X. The worst thing for me is that nobody is competing with Apple right now. This lets them do things like leave out cameras and GPS on the iPod Touch/iPad. This is what lets them lock it down. The only thing that comes even close is Google’s Android, and only Google seems to understand what it means. For all that people complain about the supposed “Apple tax” I don’t see anything competing with the iPod Touch, and what, really, is in the iPad that someone couldn’t have come out with yesterday? Does nobody else care about design and usability? Instead, the geeks are focusing around outdated features like app multitasking. This is not an issue for devices that only display one window at a time. The iPod Touch multitasks where it needs to—with apps that don’t have to use the screen—and I suspect the iPad will as well. As long as when you switch from one app to another it’s fast and you end up right where you left off, there is no difference between that and keeping those apps running in the background. I suspect that even when Apple does enable third-party multitasking, they’ll do so in a very restrictive way. I get annoyed at all the apps on my Mac that install background processing; I’d hate to have these things burning my battery and CPU time on my iPod Touch. That doesn’t mean I agree with Apple for locking down that aspect; but it is one factor in the iPod Touch’s usability. Speaking of things that burn battery and CPU time, I liked (snark) the Gizmodo hands-on review: it’s fast, really fast. So we’d like to slow it down by having it run Flash. Further update: the spec documents have been updated and the 3GS version of the iPad does include full GPS. 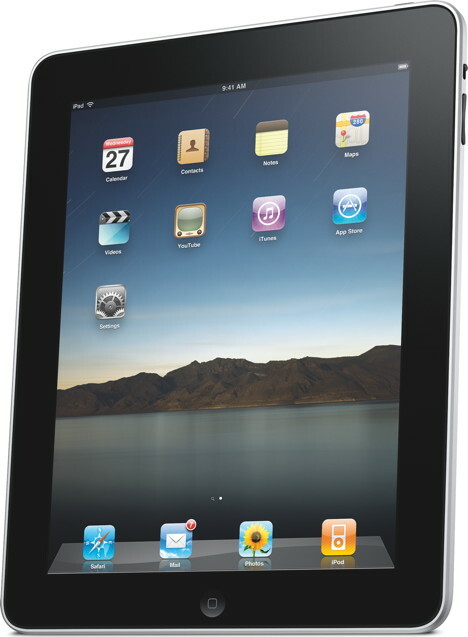 Spread your wings: the new iPad last modified September 17th, 2010.